Young Guru is Jay-Z's engineer and was nominated for a Record of the Year Grammy for his role behind the boards in the production of the Roc Nation chief's 2009 hit (with Alicia Keys) "Empire State of Mind." However, it's as a DJ where Guru started in the music industry some 20-plus years ago, and a DJ he still remains today, headlining at H Street's Lodge at Red Rocks on February 21st. Blessed with an encyclopedic knowledge of music acquired over a career that has seen the DJ literally travel the globe in search of the perfect beat, his sets are rooted in hip-hop, but make pleasant deviations through all other genres and cultures great and small. He's joined on the 21st by DC's own Steven Faith, who could actually be described as somewhat of a local legend for open-format DJs. His standard of excellence has actually provided the blueprint for success followed by many rising and globally-renowned DC-born and bred DJs and producers. Cosigned by the likes of Mad Decent Records, Steven also lists touring DJ credits with emcee Tabi Bonney among his considerable accomplishments. Growing up comfortable in DC's punk and go-go scenes, a soulful style that blends seamlessly with his wild edges defines the typical expectation of his mixes. a) Young Guru's a 90s era Howard University alumnus who never shies from his DC connections. This means that he remembers what Georgia Avenue and H Street looked, sounded and felt like 20 years ago, and his sets will absolutely reflect that. In fact, nine times out of 10, he personally knows the artist that recorded a certain hit record of that era, or remembers the first time he heard it played in a club in the Nation's Capital, too. That type of knowledge of time, space and place makes Young Guru - and especially his sets in DC - special. b) Here's a fun DC/Young Guru factoid: Young Guru's first "big-time" music industry position was being the tour DJ for Nonchalant. Yes, that's the same DC_born Nonchalant whose single "Five O'Clock" was a Billboard top-40 charting and gold-certified single in 1996. If looking for a night where what are truly some of the ultimate (both underground and mainstream) pop-friendly party records literally of all time will be played all night long (by someone with an intimate knowledge of many of them), then The Lodge at Red Rocks on February 21st is absolutely the place to be. 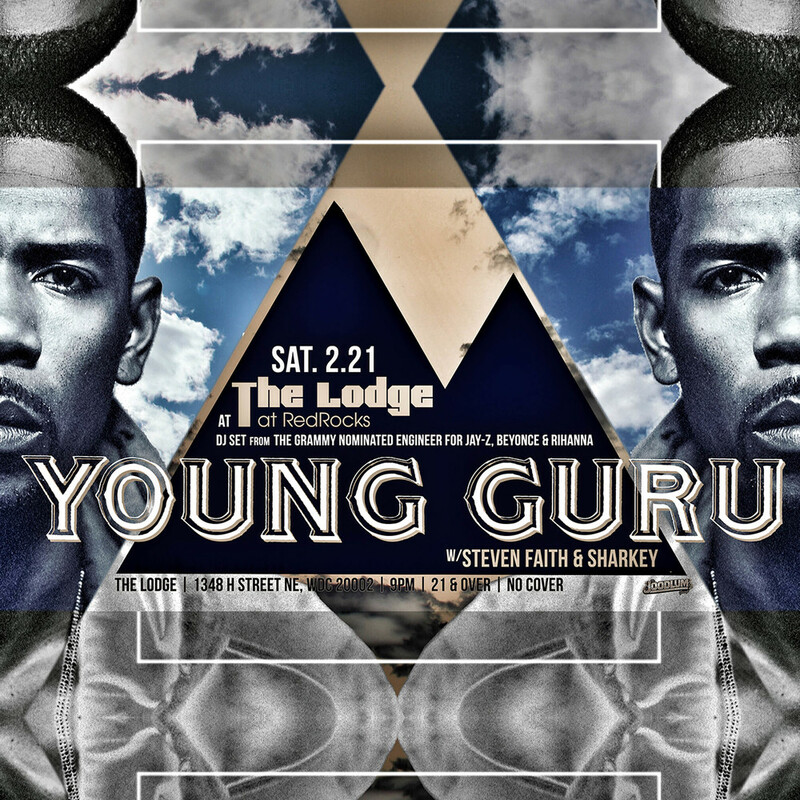 Young Guru will be playing alongside Steven Faith & Lodge resident, Sharkey. Doors open at 9pm. No Cover. More event details HERE.